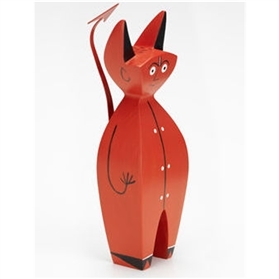 New to the HOME COMPLEMENTS collection, this 'Little Red Devil' designed by Alexander Girard is a charming enhancment to any interior. Part decorative object, part toy the 'Little Red Devil' was designed for 'The Magic of the People' Fair, Texas in 1968. The Red Devil was a very dominant symbol at the show which featured more than 5000 pieces of folk art.